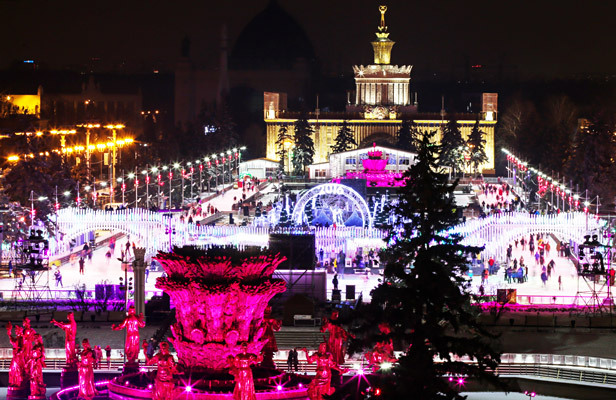 The VDNKh skating rink stretches out over an area of 20,549 square meters and can accommodate more than 4,500 skaters simultaneously. A skating rink at Moscow’s Exhibition of Achievements of National Economy (VDNKh) has been officially named as the world’s biggest skating arena with synthetic ice, according to the World Record Academy, the exhibition’s press service said on Dec. 13. "The World Record Academy announced that the VDNKh skating rink is the world’s biggest arena with synthetic ice thereby stripping Mexico City’s skating rink of its title held since 2008. The Academy’s judges admitted their mistake in measurements and officially proclaimed the ice rink at VDNKh to be the new record-setter," the press service went on to say. The VDNKh skating rink stretches out over an area of 20,549 square meters and can accommodate more than 4,500 skaters simultaneously. Moscow’s rink was first deprived of the right to bear the title of world’s biggest ice rink because wrong measurements had been taken of Mexico City’s skating rink, the source explained. In 2008, the World Record Academy’s Commission announced the ice rink located in Mexico City’s central square as the world’s biggest with an alleged total area of 32,000 square meters. The arena’s real size was 3,080 square meters (40m by 77m). The Academy’s judges noticed the error and admitted the mistake.